The patridge is the homely and smaller cousin of the pheasant. According to Greek mythology, the partridge was born out of the rage and jealousy of Deadalus. Deadalus was an accomplished and skilled craftsman. But his clever nephew, Perdix, had invented the saw and other mechnical wonders. Deadalus became jealous of his nephew’s skills. Once when they were working together on top of the Acropolis, Deadalus threw Perdix off of the building hurling him toward the ground. Athene in a moment of pity and admiration for the boy’s skill and artistry as a craftsman, turned the boy into a partridge as he fell to the ground to save him. Forever remembering the fall from the top of the Acropolis, the partridge ashews nesting in trees and instead builds its nests on the ground–obviously still fearing heights. The partridge forages and eats seeds that it finds on the ground. In funerary art, the partridge often serves as a decorative device. 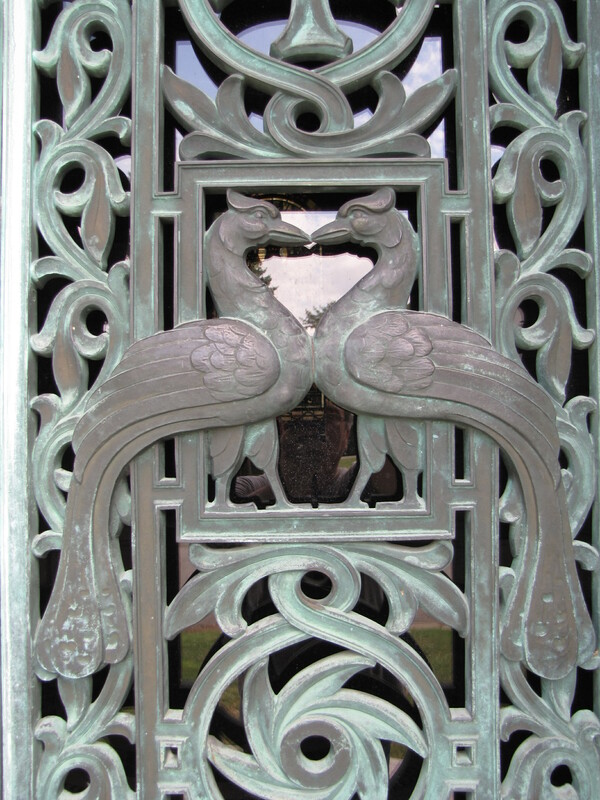 Most likely these two partridges adorning mausoleum doors in the Sleepy Hollow Cemetery are purely ornamental. In Christian lore the partridge, however, is associated with the Devil as an incarnation of Satan. It can represent temptation and even damnation. I’ve never heard any of this….how fascinating! So how did they decide on the partridge for the pear tree in the 12 days of Christmas? You might wish to google partridge images. Those sure don’t look like partridges to me. Have you googled images of partridges? Those sure don’t look like partridges to me………. As a viewer points out, the image is not an exact replica of a partridge. It is possible that the birds are pheasants or peacocks but those are not exact matches either. Many of the symbols found on gravestones are representational and not exact replicas of the objects, flowers, or animals they are meant to symbolize. This looked like the closest match to me. It’s a peacock, in cemetery art peacocks are symbols of immortality, eternity, resurrection, and the incorruptibility of the flesh. Please see my post about The Peacock from August 23, 2011.